A new mikvah (ritual bath) was inaugurated in the town of Leshem in Samaria Sunday. 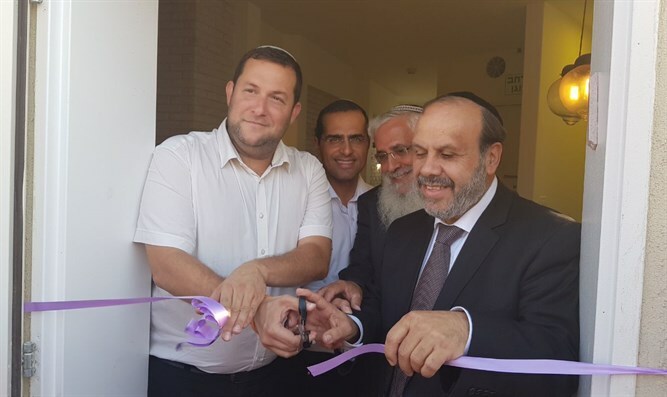 The event was attended by Religious Affairs Minister David Azoulay, Samaria Regional Council head Yossi Dagan, Director General of the Ministry of Religious Affairs Oded Plus, Samaria Religious Council head Moshe Cohen, and local residents. "If you have to choose between building a mikvah and building a synagogue, you should prefer the mikvah, That is what Rabbi Ovadia Yosef said. I didn't understand these words before, but today I understand them," said Minister Azoulay. From a halakhic point of view, Jews can pray in a hall, classroom, shelter - in fact, anywhere, as long as there is an Ark with a Torah, but the laws of family purity cannot be observed without a mikvah. Azoulay was asked about allegations that the construction of the mikvah constituted 'religionization.' "I don't know what 'religionization' is. I know what it is when people are observant. We came to inaugurate a mikvah here. We build mikvahs everywhere. Of course, when it comes to Judea and Samaria, the issue is even more important (because it prevents women from driving on the roads at night, ed.). We came today to inaugurate a mikvah, and the time has come that all communities in the Jewish state should have a mikveh. If this is 'religionization,' then I am happy there is 'religionization.'" Samaria Regional Council head Yossi Dagan said: "Leshem is a settlement which is developing quickly. The mikveh is another important step in strengthening the community." "The Council will continue to invest for the benefit of the residents in institutions that serve the public. This is the best way to strengthen the settlement and strengthen the residents,"
The mikvah was established with the assistance of the Ministry of Religious Affairs, the Samaria Regional Council, and donors.